Two films combine fire and water. Courtesy Bill Viola Studio. Photo: Kira Perov. Fire performer: Robin Bonaccorsi. Water performer: John Hay. A woman on screen gives birth. Starting with laboured breathing, she moves on to screams of agony, before the baby appears and the camera focuses on the baby's serene face. 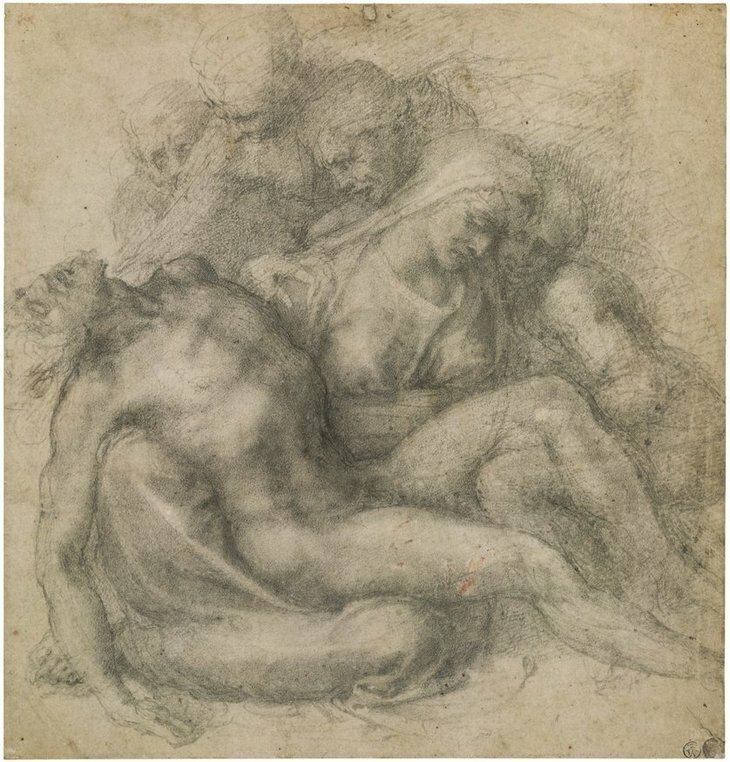 Opposite this film by Bill Viola are drawings by Renaissance master Michelangelo of the Virgin cradling the infant Christ, mirroring what we've just witnessed. 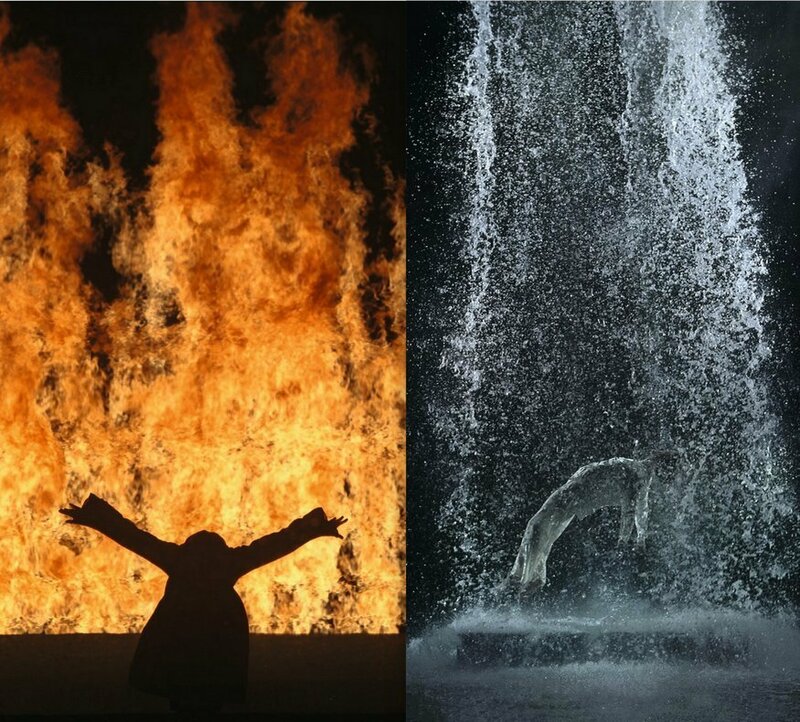 The Royal Academy of Arts has brought together the moving films of contemporary artist Bill Viola, with the drawings of Michelangelo that have served as his inspiration. It's a spectacular combination of two ingenious artists resulting in an early contender for exhibition of the year. 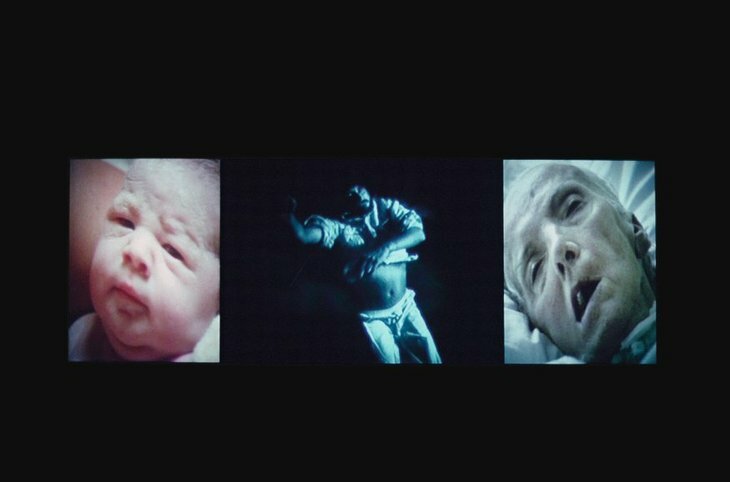 The woman giving birth is part of a video triptych of life and death all playing simultaneously. The final video in the series shows Viola's own mother on her deathbed hooked up to machines as life drains from her. We turn away only to see a Michelangelo drawing of the Virgin holding the dead Christ in her arms. Both works are beautiful. Both are heartbreaking. In one room this exhibition has summed up the beauty, pain, joy and sadness that comes with life and death. We're emotionally drained and we've only just begun to explore this massive show. The Royal Academy galleries are transformed as visitors wander through dark spaces gazing up at massive projections of films by Viola. The largest gallery has screens on every wall and it's hard to imagine this being the same space that's always jam-packed with artworks in the summer exhibition. The darkness results in a revered hush throughout the galleries as people explore the space. It's fitting given both Viola and Michelangelo's works tackle the theme of religion, and viewers become the enraptured congregation. 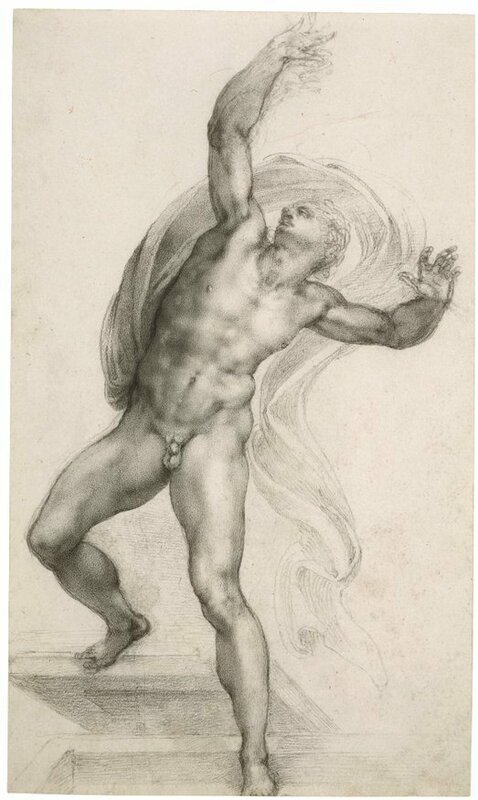 Michelangelo fans may feel a little short changed here as there's only about 20 of his small drawings here. However, Viola is the star of this show and he's more than capable of holding audiences rapt through his work alone. Individuals lie still underwater, little air bubbles occasionally escaping their mouths as the only signs they are still alive, while a man emerges from deep underwater before breaking the surface with a gasp of air and then floating back down into the depths. Viola's works often have a slow build followed by a moment of explosion that's well worth waiting for. This is an exhibition that rewards patience and standing in the darkness — a pleasant change of pace free from the distractions one faces in a well lit gallery. Some of the best works are saved for last. First, the delicate details in drawings by Michelangelo of Christ's crucifixion and resurrection. Then you progress into an adjacent room where similarly a body lies on a slab, wrapped in a wet shroud, surrounded by water. Over time the water starts to rise upwards before becoming a raging deafening torrent that drags the body up towards the ceiling. The same screen then switches from water to fire. A hooded figure standing in front of burning flames plunges into the invisible water below, which triggers the water to rise up and consume the flames. Both are awe-inspiring films that remind us of our fragile mortality. Religion, birth, death and resurrection. It's all contained within this deeply moving, powerful and memorable exhibition. We're all born, we all live and we will all die. If we get to fill our lives with such impressive artworks, then it shall be a life well lived. Bill Viola / Michelangelo: Life, death, rebirth is on at Royal Academy of Arts. From 26 January to 31 March. Tickets are £20.